On Saturday, April 30, 2016, the Monterey Japanese American Citizens League (JACL) celebrated the 90th anniversary of the historic JACL Hall, located at 424 Adams Street in Monterey. On a warm, sunny day, guests were greeted outside the Hall’s front door by the powerful percussive sounds of the Shinsho-Mugen Daiko drum group. Inside the Hall, the program began at 2:00 p.m. with welcoming remarks by JACL president, Jeff Uchida, and introduction of special guests including Mayor Clyde Roberson, City of Monterey, and Mayor Bill Kampe, City of Pacific Grove. Other highlights included songs by students from the Monterey Japanese Language School, a demonstration of the Urasenke Tea Ceremony, and an informal discussion about the Hall with local historians Sandy Lydon and Tim Thomas. At the conclusion of the program, guests mingled to exchange stories and enjoy the sushi, desserts and refreshments. Still located at its original site, ground was broken in 1925 and construction was completed in 1926. 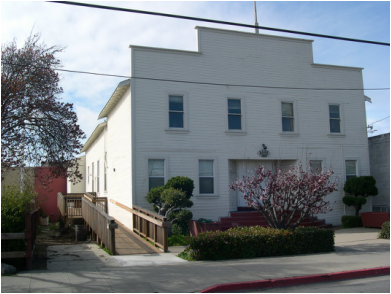 It was initially known as the Japanese Association Hall because the Nihonjinkai (Japanese Association) spearheaded the fund raising by getting pledges from the Monterey Japanese community. A center of community activity, the Hall was used for group meetings, social events, weddings, Japanese language school, religious services, and served as a place where community members could get legal and financial advice. At the start of WWII, ownership title was transferred from Issei leaders in Nihonjinkai to Nisei in the JACL. From 1942-1945, the California National Guard used the JACL Hall as an armory. In July of 1945, the Hall was converted into a hostel to provide temporary housing for people returning from the internment camps. Periodically, the JACL Hall has been refurbished and upgraded to keep out the rain and to preserve the building’s structural and historical integrity. Most currently, the Hall has a completely renovated kitchen and the JACL/HC has converted basement space into a museum that houses artifacts and documents reflecting the history and culture of Japanese immigrants and Japanese Americans on the Monterey Peninsula. Today the JACL Hall remains a rare and distinctive example of an architectural style known as Western false front. In April of 2003 the Hall was designated as a historic landmark by the City of Monterey. It is this unique history that the JACL honored and celebrated on April 30, 2016, an event attended by about 125 people. JACL is a 501(c)(3) nonprofit organization. Donations, always appreciated, are tax deductible.